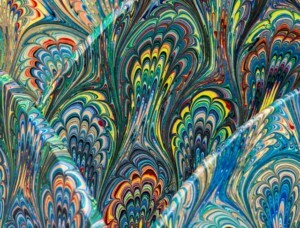 Experience the magic of marbling! 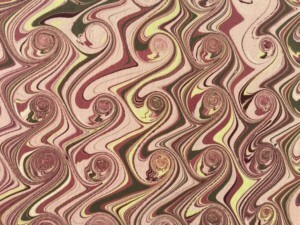 During this week students will gain an in-depth understanding of European marbling. 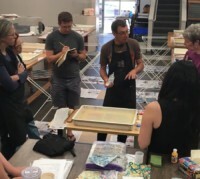 The beginning of the week will involve hands on experience of all aspects of Western marbling techniques from paper priming, preparatory mixing of water medium and paints; to the creation of classical and spontaneous patterns. Specific attention will be given to learning how to obtain particular designs using a diverse array of rakes and combs. Students will have ample time for experimentation with guidance from the instructor and will create a sampling of papers they’ve marbled themselves. 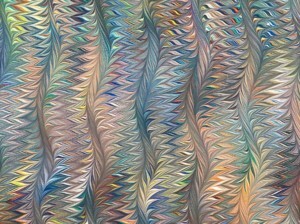 In the second half of the week students will deepen their marbling skills with the introduction of marbling on fabric, as well as creating new and more complex patterns such as the Moire’ and Spanish Wave. 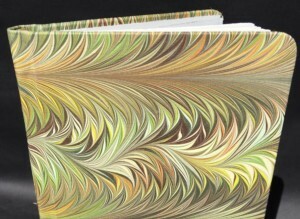 The main focus will be marbling fabric to create book cloth, which can be used for covering decorative boxes as well. If desired, each student can expand into the realm of utilizing their newly created book and box cloth to bind their own blank journal and/or create their own decorative 2-drawer or clamshell box. All materials will be provided by the instructor. 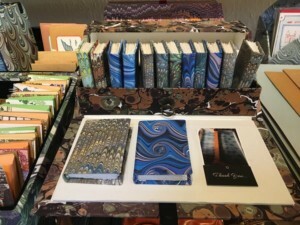 These include paper, fabric, a book, box, and all the materials and parafernalia for Marbling. Primer, paints,carrageenan etc….. is all included in this fee. 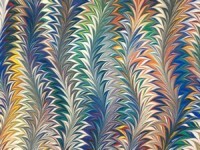 If the students have their own special paper or fabric that they wish to marble, they are free to bring it along. You need to bring only an apron. A material fee of $70 will be payable to the instructor on Monday morning when the class first meets. Read our blog interview with Pietro here. 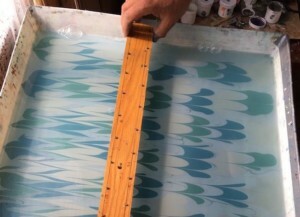 Pietro is native to the northwestern Italian city of Turin where his father Gaetano operated “Tipografia Accardi.” In 1950s Italy, it was a state of the art printing press. His youth spent in the press lead him to paper marbling, restoration and bookbinding. Pietro founded “La Legatoria del Sole,” a bookbindery in Turin. It served Turin’s Municipal Archives, main public and university libraries. He now teaches at the San Francisco Center for the Book, Nevada Museum of Art, and Castle in the Air in Berkeley, CA. 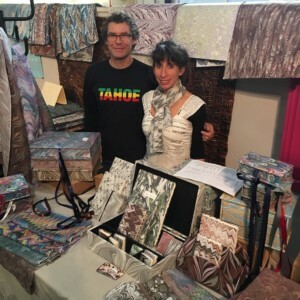 Together with his wife Vanessa he has founded Accardi Book Arts, a book arts studio and bindery.